Almost 30 years after visiting Notre Dame as a recruit, Blake Brockermeyer will likely be back in South Bend as the father of a recruit soon. Brockermeyer was at the Irish’s spring game back in 1990 as part of his own recruiting process, which would eventually lead him to Texas, where he starred as an offensive lineman before going on to a decade-long NFL career. “Coach (Lou) Holtz recruited me out of high school,” he remembers. “I went up there for their spring game. It was a long time ago. I don’t remember a whole, whole lot about it, but my dad and I flew up there my junior year. 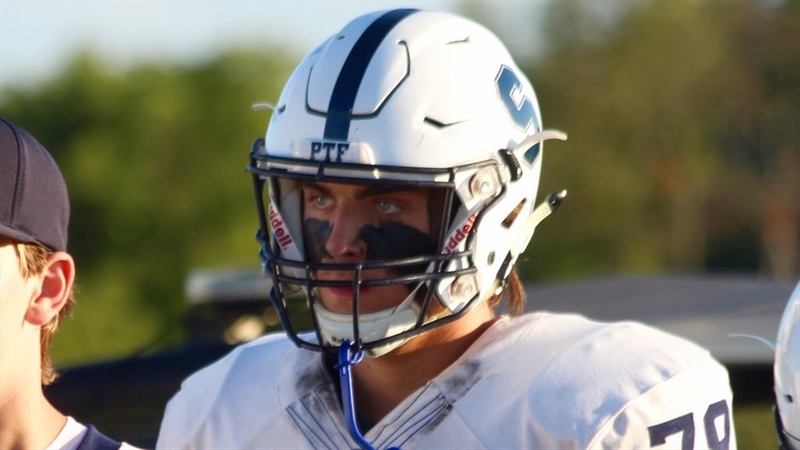 Last month, Notre Dame officially entered the recruiting process for Brockermeyer’s son, offering 2021 Texas offensive lineman Tommy Brockermeyer‍. “That’s a big one,” Mr. Brockermeyer says. “We’re excited about that one. Despite not picking Notre Dame out of high school, Brockermeyer does have additional connections to the Irish. He was drafted in the first round of the 1995 NFL Draft by then-Carolina Panthers general manager Bill Polian, the father of current Notre Dame assistant Brian Polian. Polian offered the Brockermeyers the chance come back for this weekend’s spring game, but Brockermeyer has one son playing at Texas now and is on the staff at SMU himself. Both have their spring games on Saturday. Instead, the Brockermeyers expect to get to South Bend in May or June. Tommy Brockermeyer has gathered up major scholarship offers from programs like Texas, Oklahoma, Michigan, LSU and Auburn among many others. His twin brother James, who plays center for All Saints Episcopal, is also a top prospect with offers from Oklahoma, Oklahoma State, Michigan and Iowa among others. “It’s been an interesting last few months for sure,” Mr. Brockermeyer says. “I saw this coming a few years ago, but I didn’t think it was going to start this early and get this crazy so early. With his experience as a player and coach, Mr. Brockermeyer helps his sons as much as he can. “I never played center, so I don’t know a ton about that, but I know enough to where I can help him and get him videos and techniques,” he says. “With Tommy, I can actually go on the field and show him the techniques and what the NFL guys are doing. I’m still in touch with some of my NFL o-line coaches. They send me clips and videos. I have access at SMU to download stuff. He can also help them navigate the recruiting process. “I’ve lived it myself,” he says. “Times are different now, but you can tell a fake from a mile away. We’re going to places that are offensive line-friendly, good to great academics and great schools you would want to go to even if you weren’t playing football, somewhere if something were to happen that you couldn’t play, just going to school there. Mr. Brockermeyer is a good resource for the brothers, who plan to enroll early, but they’ll be making the call. The brothers could end up at the same school, but they aren’t necessarily a package deal, according to their father. “It’s not something that is a done deal that they have to go to the same school, but it sure would make Mom and I’s lives a little bit easier,” he laughs. “At the end of the day, if one of them goes to Notre Dame and I’ve got one at Texas and I’ve got one at Michigan, then, that’s just the way it works out.